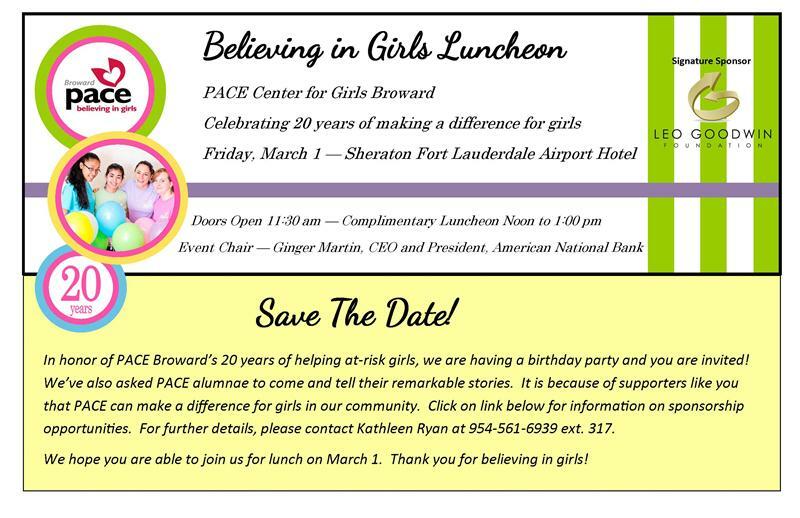 ANB’s own Ginger Martin is the Event Chair for the 11th Annual Believing in Girls Luncheon held by the Pace Center for Girls Broward. The event will be held Friday, March 1st at the Sheraton Fort Lauderdale Airport Hotel. Doors open at 11:30AM. The mission of the Pace Center is to provide girls and young women an opportunity for a better future through education, counseling, training and advocacy. You can learn more about Pace Center at http://www.pacecenter.org/centers/broward. This entry was posted on Thursday, February 21st, 2013 at 3:05 pm and is filed under Uncategorized. You can follow any responses to this entry through the RSS 2.0 feed. You can leave a response, or trackback from your own site.